For the luminosity function in astronomy, see Luminosity function (astronomy). 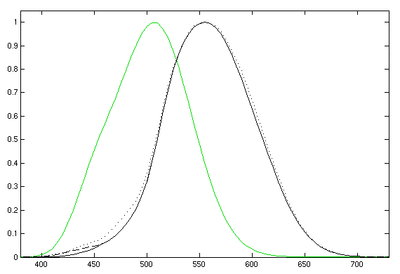 Photopic (black) and scotopic (green) luminosity functions. [c 1] The photopic includes the CIE 1931 standard[c 2] (solid), the Judd–Vos 1978 modified data[c 3] (dashed), and the Sharpe, Stockman, Jagla & Jägle 2005 data[c 4] (dotted). The horizontal axis is wavelength in nm. A luminosity function or luminous efficiency function describes the average spectral sensitivity of human visual perception of brightness. It is based on subjective judgements of which of a pair of different-colored lights is brighter, to describe relative sensitivity to light of different wavelengths. It should not be considered perfectly accurate, but it is a good representation of visual sensitivity of the human eye and it is valuable as a baseline for experimental purposes. Different luminosity functions apply under different lighting condition, varying from photopic in brightly lit conditions through mesotopic to scotopic under low lighting conditions. Without qualification, the luminosity function generally refers to the photopic luminosity function. The CIE photopic luminosity function y(λ) or V(λ) is a standard function established by the Commission Internationale de l'Éclairage (CIE) and may be used to convert radiant energy into luminous (i.e., visible) energy. It also forms the central color matching function in the CIE 1931 color space. There are two luminosity functions in common use. For everyday light levels, the photopic luminosity function best approximates the response of the human eye. For low light levels, the response of the human eye changes, and the scotopic curve applies. The photopic curve is the CIE standard curve used in the CIE 1931 color space. λ is the wavelength, in nanometres. The standard luminosity function is normalized to a peak value of unity at 555 nm (see luminous coefficient). The value of the constant in front of the integral is usually rounded off to 7002683000000000000♠683 lm/W. The small excess fractional value comes from the slight mismatch between the definition of the lumen and the peak of the luminosity function. The lumen is defined to be unity for a radiant energy of 1/683 W at a frequency of 540 THz, which corresponds to a standard air wavelength of 555.016 nm rather than 6993555000000000000♠555 nm, which is the peak of the luminosity curve. The value of y(λ) is 6999999997000000000♠0.999997 at 6993555016000000000♠555.016 nm, so that a value of 683/6999999997000000000♠0.999997 = 683.002 is the multiplicative constant. The number 683 is connected to the modern (1979) definition of the candela, the unit of luminous intensity. [cie 2] This arbitrary number made the new definition give numbers equivalent to those from the old definition of the candela. The CIE 1924 photopic V(λ) luminosity function,[cie 3] which is included in the CIE 1931 color-matching functions as the y(λ) function, has long been acknowledged to underestimate the contribution of the blue end of the spectrum to perceived luminance. There have been numerous attempts to improve the standard function, to make it more representative of human vision. Judd in 1951, improved by Vos in 1978, resulted in a function known as CIE VM(λ). More recently, Sharpe, Stockman, Jagla & Jägle (2005) developed a function consistent with the Stockman & Sharpe cone fundamentals; their curves are plotted in the figure above. For very low levels of intensity (scotopic vision), the sensitivity of the eye is mediated by rods, not cones, and shifts toward the violet, peaking around 507 nm for young eyes; the sensitivity is equivalent to 7003169900000000000♠1699 lm/W or 7003170000000000000♠1700 lm/W at this peak. The standard scotopic luminosity function or V′(λ) was adopted by the CIE in 1951, based on measurements by Wald (1945) and by Crawford (1949). Protanopic (green) and deuteranopic (red) luminosity functions. For comparison, the standard photopic curve is shown in yellow. Color blindness changes the sensitivity of the eye as a function of wavelength. For people with protanopia, the peak of the eye's response is shifted toward the short-wave part of the spectrum (approximately 540 nm), while for people suffering deuteranopia, there is a slight shift in the peak of the spectrum, to about 560 nm. People with protanopia have essentially no sensitivity to light of wavelengths more than 670 nm. Most non-primate mammals have the same luminosity function as people with protanopia. Their insensitivity to long-wavelength red light makes it possible to use such illumination while studying the nocturnal life of animals. For older people with normal color vision, the crystalline lens may become slightly yellow due to cataracts, which moves the maximum of sensitivity to the red part of the spectrum and narrows the range of perceived wavelengths. ^ Charles A. Poynton (2003). Digital Video and HDTV: Algorithms and Interfaces. Morgan Kaufmann. ISBN 1-55860-792-7. ^ Wyszecki, Günter & Stiles, W.S. (2000). Color Science - Concepts and Methods, Quantitative Data and Formulae (2nd ed.). Wiley-Interscience. ISBN 0-471-39918-3. ^ Judd, Deane B. & Wyszecki, Günter (1975). Color in Business, Science and Industry (3rd ed.). John Wiley. ISBN 0-471-45212-2. ^ Vos, J. J. (1978). "Colorimetric and photometric properties of a 2° fundamental observer". Color Research and Application. 3 (3): 125–128. doi:10.1002/col.5080030309. ^ Stiles, W. S.; Burch, J. M. (1955). "Interim report to the Commission Internationale de l'Eclairage Zurich 1955, on the National Physical Laboratory's investigation of colour-matching". Optica Acta. 2 (4): 168–181. Bibcode:1955AcOpt...2..168S. doi:10.1080/713821039. ^ Sharpe, L. T.; Stockman, A.; Jagla, W.; Jägle, H. (2005). "A luminous efficiency function, V*(λ), for daylight adaptation" (PDF). Journal of Vision. 5 (11): 948–968. doi:10.1167/5.11.3. Archived from the original (PDF) on Apr 26, 2012. ^ "Colorimetry -- Part 1: CIE standard colorimetric observers". Retrieved December 9, 2018. ^ "Kay & Laby;tables of physical & chemical constants;General physics;SubSection: 2.5.3 Photometry". National Physical Laboratory; UK. Retrieved December 9, 2018. ^ Kohei Narisada; Duco Schreuder (2004). Light Pollution Handbook. Springer. ISBN 1-4020-2665-X. ^ Casimer DeCusatis (1998). Handbook of Applied Photometry. Springer. ISBN 1-56396-416-3. ^ a b Judd, Deane B. (1979). Contributions to Color Science. Washington D.C. 20234: NBS. p. 316. ^ I. S. McLennan & J. Taylor-Jeffs (2004). "The use of sodium lamps to brightly illuminate mouse houses during their dark phases" (PDF). Laboratory Animals. 38: 384–392. doi:10.1258/0023677041958927. PMID 15479553. ^ "CIE Selected Colorimetric Tables". Archived from the original on 2017-01-31. ^ 16th Conférence générale des poids et mesures Resolution 3, CR, 100 (1979), and Metrologia, 16, 56 (1980). ^ CIE (1926). Commission internationale de l'Eclairage proceedings, 1924. Cambridge University Press, Cambridge. ^ "CIE Scotopic luminosity curve (1951)". Archived from the original on 2008-12-28. ^ "CIE (1931) 2-deg color matching functions". Archived from the original on 2008-12-28. ^ "Judd–Vos modified CIE 2-deg photopic luminosity curve (1978)". Archived from the original on 2008-12-28. ^ "Sharpe, Stockman, Jagla & Jägle (2005) 2-deg V*(l) luminous efficiency function". Archived from the original on 2007-09-27.